Britain's Andy Murray beat Mackenzie McDonald 3-6 6-4 7-5 in the Washington Open's first round in his fourth match following hip surgery in January. Murray, 31, converted his seventh match point after more than two-and-a-half hours on court against the American. "Mentally, it was a big one to get through," said former world number one Murray. "I fought hard and I had to. The movements and stuff were fine." He will now play fellow Briton Kyle Edmund, 23, in the second round. Edmund beat Murray at Eastbourne in the third match of his return during the grass-court season before the Scotsman pulled out of Wimbledon as he felt it was "too soon" to play five-set matches following his rehabilitation. "I'll have to play much better if I want to win that match, more aggressively," Murray said. "It will help having one more match under my belt." Murray had been out of action since Wimbledon 2017 before having his operation at the start of this year. After the Citi Open in Washington he also hopes to play Masters-level events in Toronto and Cincinnati in preparation for the US Open. He was broken in two of his first three service games on the way to losing the opening set in 40 minutes against 23-year-old McDonald, who is ranked 80th in the world. In the second set, Murray, whose own world ranking has dropped to 832, broke in the ninth game to take a 5-4 lead and served out to take the match to a decider. He was then 5-4 up and serving for the match in the third set but McDonald saved five match points then converted his second break point to draw level at 5-5. 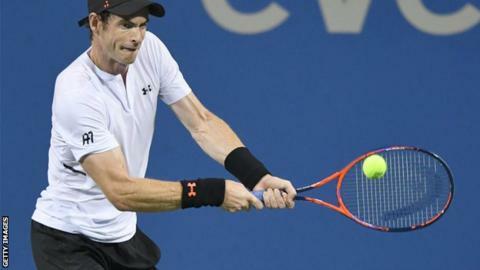 But Murray immediately broke back - in a game that included a controversial call when McDonald's racket was adjudged to have crossed the plane of the net with the score 30-30 - before serving out to win a 73-minute set and reach the second round. "I enjoyed getting through that one. You could see it in the celebration," Murray said. "That was a tough match. It could have gone either way. It was nice to win it." The match was Murray's first on a hard court since March 2017 at Indian Wells and his first experience with a serve clock, which will be used at the US Open from 27 August. "I hadn't played in darkness or under the lights in a really long time and I felt my rhythm was off," Murray said. "I was struggling on my serve. I cut the unforced errors a little bit in the second set and started serving better." The serve clock, which was used at the 2018 Australian Open, allows players 25 seconds to start their service motion from the moment the umpire announces the score after the previous point. He added: "Without a shot clock, that would have been a three-hour match. It's a positive change for tennis." Meanwhile, three-time Grand Slam champion Murray has signed up to play in the China Open at the beginning of October.